The MB Actros has been in production since 1996. 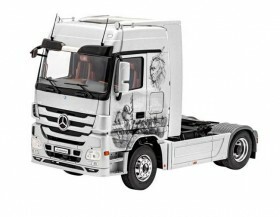 With the introduction of this heavy goods vehicle Mercedes-Benz introduced electronic engine and transmission control, an electronically controlled braking system and inter-connectivity in commercial vehicles as part of their so-called Telligent Strategy. Not just the long period of production nor the high sales figures but also multiple awards of Truck of the Year prove the success of this tractor unit. The Actros ultimately sets the standard as a measure of reliability in commercial vehicles. The first major modifications occurred in 2003, the second facelift was undertaken in 2008. With this stage - internally designated as Model Project 3 (MP = 3) - the latest modification of the first generation Actros is complete. Furthermore, the Actros continues to offer a confident and completely successful mix of efficiency, performance and comfort. The Actros is powered by the proven six-cylinder OM 541 engine with a cubic capacity of 12 litres or the OM 542 - V8 engine with 16 litres cubic capacity. They produce between 320 and 598 bhp respectively and both meet the Euro 5 emission standard. Both engines have proved themselves in the past with their pulling power and concurrent fuel economy. Unlike its predecessor the radiator grill of the MP 3 has only three ribs which gives it a much more contoured appearance.